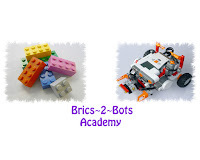 The engineers of Brics~2~Bots Lab were thinking about working on a project, Robo Jones in an Ancient Temple. 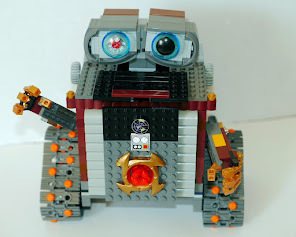 Now, we can build a layout of the inside of a temple with treasures to retrieve or we could build a temple with a tunnel, just big enough to fit a Mindstorms robot - Robo Jones, which would add to the challenge by using sensors to find the treasures that are placed in the tunnel AFTER the robot has been programmed. So the question was raised, what sensors could possibly be used in a tunnel? An Utrasonic? A Color sensor? The engineers predicted both sensors would work in the tunnel. The Ultrasonic reads reflect sound waves, so in a tunnel maze with two openings reading reflecting sound waves will not be a problem. However, a Color sensor reads reflected light, so would a partially dark tunnel have an effect on the Color sensor’s reading???? 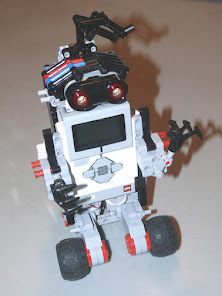 Question: Can an EV3 Ultrasonic sensor detect objects and be able read their distance accurately in a tunnel? Research: How an Ultrasonic sensor works. Hypothesis: Since an EV3 Ultrasonic sensor reads reflective sound waves, then it should be able to read objects inside the tunnel. 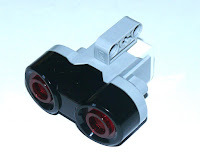 So yes, an EV3 Ultrasonic sensor should be able to detect objects in the tunnel. 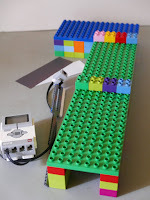 Materials: Ev3 Intelligent Brick, EV3 Ultrasonic sensor, cable, LEGO technic beams and pins, Duplo bricks and plates (to make the tunnel), pieces of white and black construction paper. 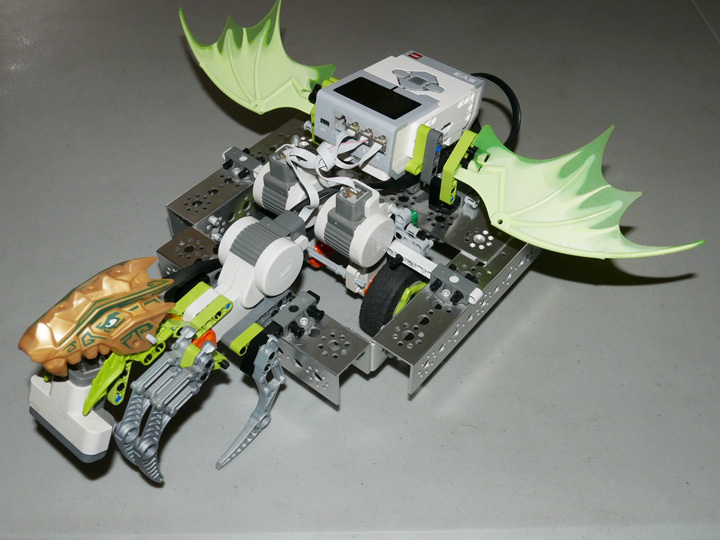 Procedure: An EV3 Ultrasonic sensor was attached to a LEGO-made stick, and a cable connected the Ultrasonic to an input port on the EV3 Brick. 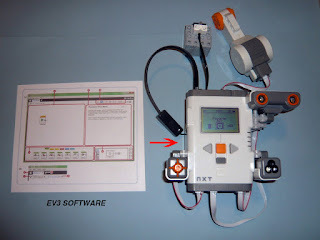 A reading was taken using Port View, on the EV3 Brick, of a wall inside the tunnel. 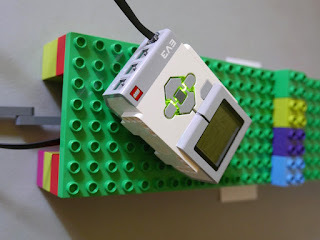 The EV3 Brick was programmed to have the Ultrasonic sensor respond to a specified distance from the wall with an action. Observation: There was a response, detecting the wall at 1.5 inches. Conclusion: Our hypothesis was correct; yes an EV3 Ultrasonic sensor can accurately detect an object in a tunnel. Question: Can an EV3 Color sensor be read accurately in a tunnel? Research: How a color sensor works. Hypothesis: Since an EV3 Color sensor gives off its own light that is reflected back in the reading, we would think yes, it could accurately take a reading in a tunnel. Materials: Ev3 Intelligent Brick, EV3 Color sensor, cable, LEGO technic beams and pins, Duplo bricks and plates (to make the tunnel), pieces of white and black construction paper. Procedure: A Color sensor was attached to a LEGO-made stick, and a cable connected the Color sensor to an input port on the EV3 Brick. A reflective light reading was taken using Port View, on the EV3 Brick, of a piece of white paper then of black paper that is inside the tunnel; write down the readings. The EV3 Brick was first programmed to have the Color sensor respond to reflective light from the Color sensor readings with a different action for each color, to note the difference. The Color sensor was slowly moved inside the tunnel to detect the white paper and then the black paper. Next, programs were written for color reading from the Color sensor for white and then black. The programs were tested inside the tunnel for detecting the white paper and the black paper. Observation: The Color sensor using reflective readings was able to respond to each color accurately. However, when using the color reading for the colors themselves, it was totally inaccurate, responding without even detecting the color papers. Conclusion: Our hypothesis was correct; yes a Color sensor when using a reflective light reading can accurately detect a target color.